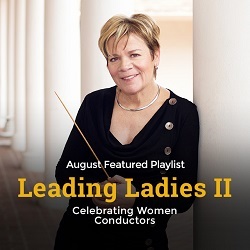 It’s one of the most notorious glass ceilings in all of the arts—until Marin Alsop was hired as music director of the Baltimore Symphony in 2007, no woman had ever held that position in a major American orchestra. You read that right: 2007. Even crazier, she had another first in 2013 when she became the first woman to conduct the Last Night of the Proms, a prestigious annual event in the U.K. with a tradition extending back to 1895. As Alsop stated in her 2013 Proms speech, it’s shocking that at this point in history there are still so many firsts left for women to attain, even in the traditionally male-dominated world of classical music. But just as more women are shattering misconceptions of what a composer should look like, so too are more women taking up the baton to challenge antiquated notions on the podium. We anticipate a future where there are no more firsts for women in music, and when any glass ceiling is a relic of history. But until that day when “maestro” is fully embraced as a gender-neutral term, we’ll keep celebrating the accomplishments of more Leading Ladies. St Paul's Suite: IV. Finale, "The Dargason"
3 Russian Songs: No. 3. My cheeks, so white, so rosy! Fine 1, "Farewell to Earthly Life"
Each month, Naxos Music Library presents a themed playlist for our subscribers to enjoy. We know that a database of over 2 million tracks can be a bit daunting, so we'd like to highlight some of the amazing music that is available to you. Let it kickstart discovery!